A Magical Nine Day Tour of Great Britain by Rail – One American’s Journey! My wife, Marea, and I decided to go on a whirlwind tour of Great Britain by rail to see places we had not been before. Throughout the trip, we encountered magical attractions, excellent food and drink but most of all we encountered the one thing that made our trip so special, the people of Great Britain. Throughout this blog, I will be sharing photos of not only the things we saw and did but also the people who we met along the way. All aboard for our Great Britain Tour! So we flew in to Edinburgh on a brand new route just launched by Norwegian Airlines. Marea and I had planned our trip based on an incredibly interesting video created by the team at VisitBritain . As I was days from becoming the Director of the America’s region for VisitBritain, I wanted to see as many sites as I could before joining the team. Strictly research, not a holiday, right? In any event, we woke up in Edinburgh at the Hilton Grosvenor and began talking with a young man named Kyle [a Glaswegian; in case that is a new one for you, it means he hails from Glasgow, Scotland] . Kyle was essentially serving as a concierge but by the end of our trip we called one another friends. We learned with great delight the Edinburgh Fringe Festival was happening. Since we planned our trip in advance, we didn’t realize it would coincide with The Fringe. Fun fact: The Fringe Festival started in Edinburgh 70 years ago and now there are Fringe Festivals that happen all over the world. There are an average of 300 shows every day during the Fringe so it is impossible not to find a great show [or 20] you will like. On day one, we walked around the city a bit, took in the Royal Mile, Queens Street, Edinburgh Castle and other terrific sites in the heart of Edinburgh. Then we saw a show and finished our night having dinner at Otro restaurant. Delicious risotto and a must do when in Edinburgh. It was the start of a terrific vacation. Woke up to a nice breakfast and an even nicer young man named Cameron who is from Dalkeith in Midlothian, Scotland. Our goal for the day was to head to Falkirk and see the Falkirk Wheel and the Kelpies. We hopped on a train and headed to the Falkirk High train station [approximately 30 minutes, could not have been easier]. For our final mile to the Falkirk Wheel we chose a quick cab ride that cost £7. However, there were other options including a regular bus that would take you to the wheel. 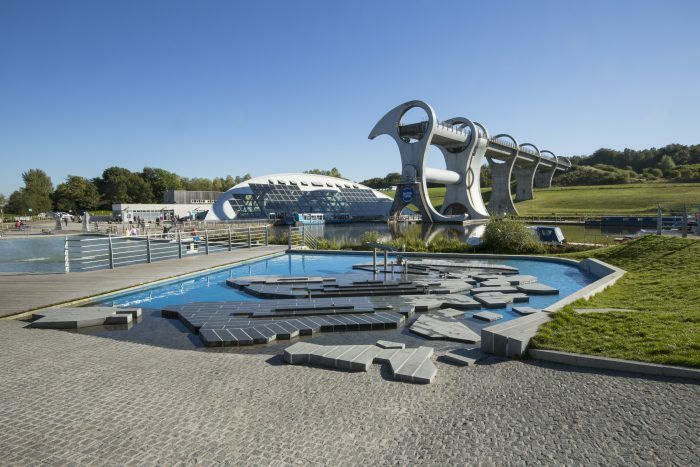 The Falkirk Wheel is an engineering marvel on the Caledonian Scottish Canal System. The one and only boat lift of its kind in the world; Her Majesty, The Queen, opened the Falkirk Wheel in 2002. Fun Fact: The wheel is 35 meters high which is the equivalent of eight double-decker buses stacked on top of each other. Next we caught a bus to see the Kelpies [approximately a fifteen minute ride and very inexpensive]. Folks, the Kelpies took our breath away. Two horse heads made of metal that stand 30 meters high, sculpted by artist Andy Scott from real-life Clydesdales Duke and Barron. You can discern the horse’s different personalities when you see them. The Kelpies, a word that means mythical horse [think Pegasus] are even more magical at night and at different times of the year when they are lit to suit the season. The Kelpies were nine years in the making and opened in 2013 and are now a worldwide attraction. I noticed people from Asia, the Middle East and every corner of the world when we were visiting them. I am not sure I can think of another attraction that is as new to the scene as the Kelpies that has become a worldwide attraction. If you don’t have a visceral emotional response to the Kelpies when you see them you may wish to get checked up for your heart at a doctor; I’m just saying. After Falkirk, we headed back to Edinburgh, had another meal at Otro [please don’t judge] and caught another Fringe Show [from memory) I think it was Tapeface, the modern day mime. Early start to the day to catch a train to the Lake District of England, a place called Windermere. Appropriately we stayed at a lovely Inn on the shores of Lake Windermere. The train from Edinburgh brought us in to Oxenholme Station, from where we took a cab to our hotel, Storrs Hall. This bucolic Northern England Cumbrian setting was just what we needed after an action-packed time in Edinburgh. We relaxed on property and had wonderful conversations with other guests and staff including one lovely man named Fred who is now an English citizen but hails from Kenya. Several of the guests talked about visiting the Beatrix Potter Gallery, the children’s book author who penned Peter Rabbit among others. Manchester and Liverpool, on our way! 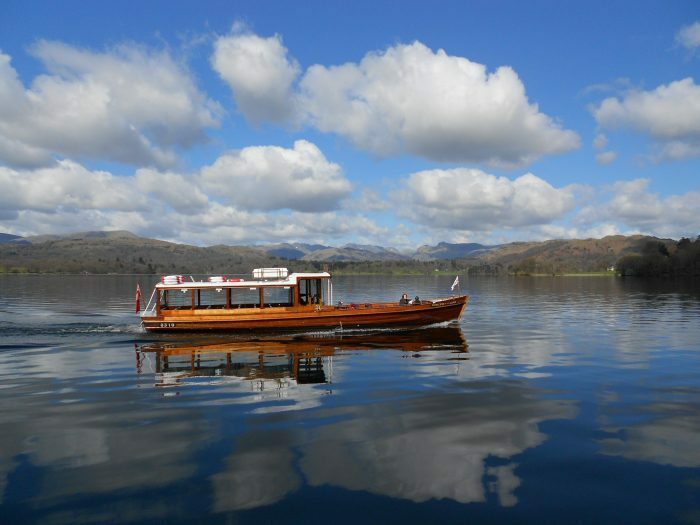 On this day, we decided to use the Windermere train station instead of going back to Oxenholme because it was less expensive for a taxi to Windermere and it was virtually the same trip with one more stop. The train went directly into Manchester [which is on the way to Liverpool]. Upon arrival, a quick jog to the Visitor Centre in Manchester laid out a wonderful walking journey for us. Among the choices was John Rylands Library that features a wonderful collection of rare books, the National Football Museum [soccer my friends, get used to it being called football!] and a cocktail bar that was featured in the VisitBritain rail video called Cloud23. 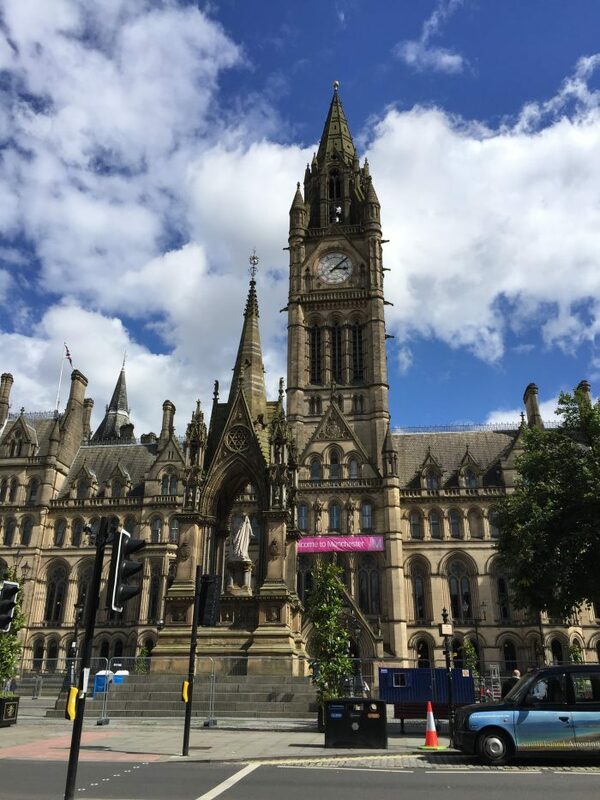 We walked through downtown and the feeling of pride in Manchester was palpable. There is a spirit and a determination in the Manchester people that is inspiring. We learned about the Manchester bees that symbolize the work ethic of its people from Town Hall Rob and we revelled in the local sites that sanitation worker Tony [who went to school with Town Hall Rob btw] told us to see. Cloud 23 had stunning views and yummy food as it sits atop the Manchester Hilton. Fun fact: there is a statue of President Abraham Lincoln in Lincoln Square in Manchester. Why? Because Manchester boycotted southern cotton when the southern states seceded from the union just prior to the American Civil War; an act that president Lincoln never forgot. Our day in Manchester complete, we headed to Liverpool on the train [just a 54 minute journey]. Bedded down in Liverpool and thought about the next time we could go back to see more of Manchester. “Whisper words of wisdom, let it be.” We’re in Liverpool yo! 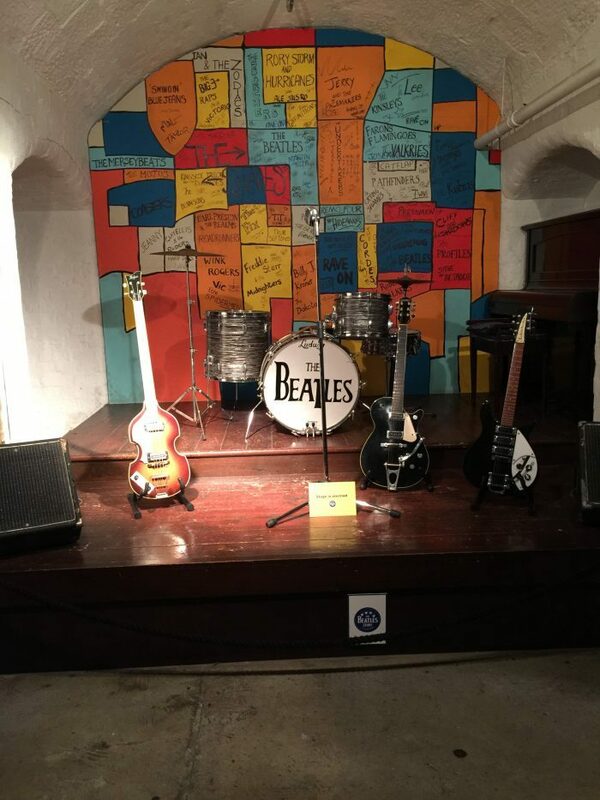 Our day starts with a light lunch in Albert Dock and a visit to the Beatles Experience. This quintessential presentation of Beatles memorabilia and things I never knew about the fab four was fantastic. I would set aside at least three hours to take in the Beatles Experience. You can also visit the bar/pub where the Beatles played back in the days before coming to America [Cavern Club]. Liverpool is a very walkable city and we also took in The Tate while we were there. As a port city, Liverpool has a rich history as a place where famous ships were commissioned for seaworthiness. Among them the Lusitania and the Titanic were commissioned in Liverpool! The day seemed to fly by and we hit our pillows looking ahead to our train ride to Cardiff, Wales. Grabbed an early train to Cardiff. A seemingly fast four and a half hours later we were firmly entrenched in Cardiff and the land of Dr. Who and Torchwood. Cardiff Castle sits prominently in the centre of town providing a backdrop like we had not see thus far on the trip. 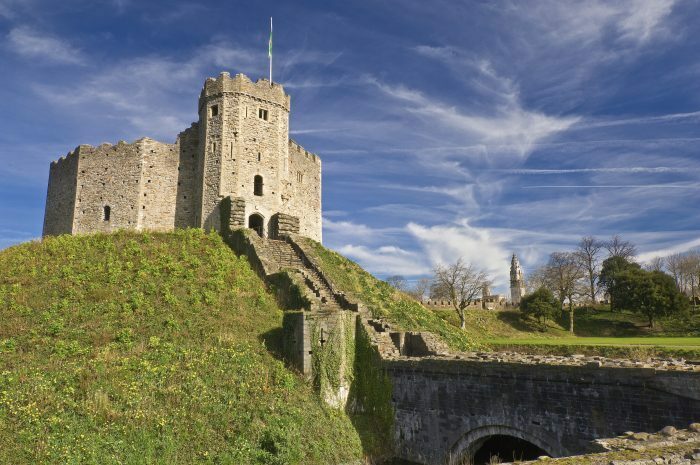 A walking tour of the city would later reveal the many episodes of Dr. Who that have used Cardiff Castle locations. So many wonderful nearby attractions including Principality Stadium, the national stadium of Wales, which is also in the heart of downtown. We met lovely people in Wales who told us about the history of Wales and the reason why a dragon represents Welsh flag. That one you need to look up on your own, but there are both practical and legendary reasons why the Red Dragon adorns the flag of Wales. Off to Bath, England today. A two-hour train ride we alight in Bath, Southwest England. 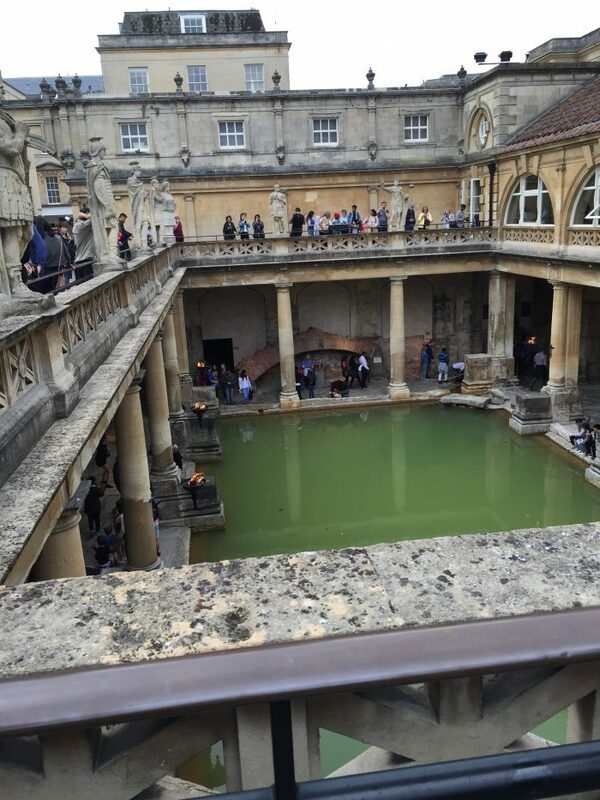 The Roman-era influence is still prominently evident in Bath. A quick taxi takes us to downtown where we embark on a self-guided walking tour and delight in the many markets with local artisans selling just-made goods. After, we take in the Roman Baths. Incredibly preserved, one can literally imagine the times when this was a public gathering place and part of daily culture. Also popular in Bath is Pulteney Bridge, the Jane Austen Centre and the Royal Crescent. Stonehenge! Building began in 3100 BC with no written records left by the originators, so there are lots of theories about why Stonehenge was built. They range from it being an alien UFO landing pad to a way for people to tell time using the sun, but in any case the place is super cool. We took an organized tour to Stonehenge from Bath. We were picked up by bus in Bath and then taken on a roughly one-hour ride to the attraction. It was quite reasonable, from memory around £70 each. On the ride, the driver told us about various places we were passing which made the ride very enjoyable. One such attraction was the chalk outline of a horse named the Bratton White Horse near Salisbury. This massive horse is 180 feet tall and 170 feet wide and is a well-known symbol for that area. 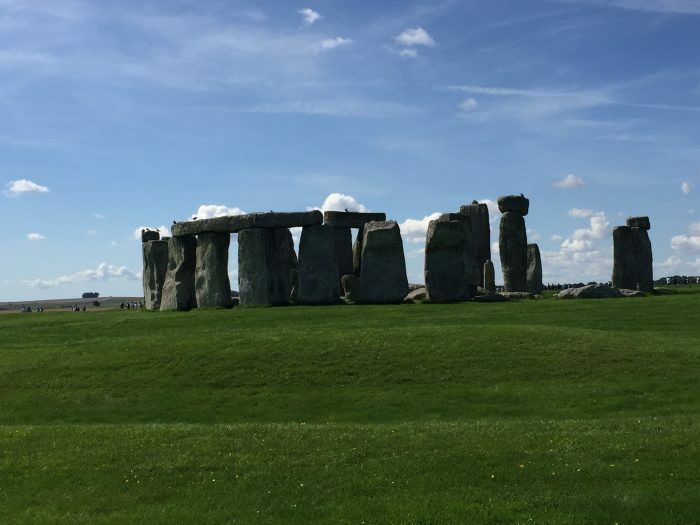 Stonehenge is a very organized experience with a lovely visitor centre and buses that take you from the centre to the attraction running regularly. On the bus we met David, the driver, from Trowbridge England. His family are farmers and he has lived his whole life in the area. A smile to light a room and I did notice “shift leader” on his name badge. Last Day…so sad but great experiences await us! Since we booked a round-trip ticket from Edinburgh, we needed to make our way back to Scotland. So we took the train from Bath fifteen minutes to Bristol Temple Meads, which was the only change for our journey. After that, four and a half hours and we were direct into Edinburgh for our last night. On second thoughts, next trip we might do an open-jawed plane ticket to give us more flexibility. Once we arrived in Edinburgh, we had perhaps one of our best meals at a place called L’Escargot Bleu that was recommended by an angel of a lady we met on the train. The chefs Bertrand and Connor were super talented creating Scottish-French fusion that we had never had before. 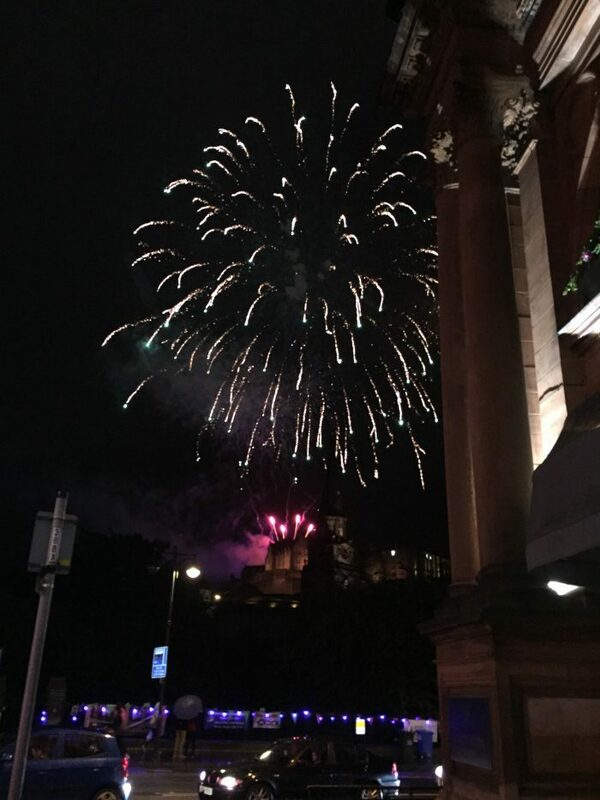 We ended our night watching fireworks over Edinburgh Castle as part of the military tattoo that was happening and then caught Craig Ferguson, a Scot, in his live show recording a podcast as part of The Fringe. Put simply, the train experience was seamless, and the biggest takeaway for us is how easy and close it is to get around the whole of Great Britain. For an American, I am used to flying between cities but in four hours on a train you can be nearly everywhere in Great Britain.